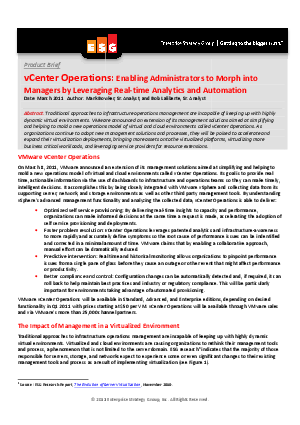 Traditional approaches to infrastructure operations management are incapable of keeping up with highly dynamic virtual environments. VMware announced an extension of its management solutions aimed at simplifying and helping to mold a new operations model of virtual and cloud environments called vCenter Operations. This product brief highlights key findings of ESG's 2011 Virtualization Management survey to illustrate a shift in the way customers are approaching the management of their infrastructure and operations tools, people and processes.